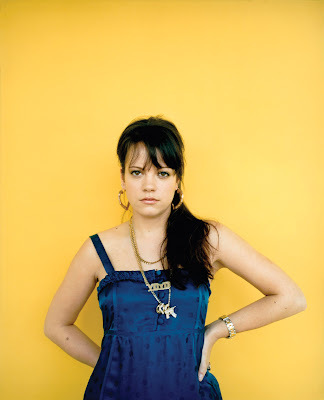 As featured on Popjustice today, Lily Allen's new song The Fear will be released on January 26th 2009. It's the first single from her "It's not me, it's you" album, which the music press eagerly awaits to praise/tear apart. For the past year Lily has been more the celebrity than the pop star and many have waited for her to have an Amy moment or two, but she hasn't really. The only Lily Allen song I really liked was Alfie but I liked The Fear (what a great song title too!) as soon as I heard it. I love the "look at the sun, look in the mirror" lyrics, still a London girl and all heart. The video for the song is on Channel 4 at 11:05pm on Thursday 4th of this lovely month. Here it is, popfans! Starting today is a new series, on Strike Curious Poses, of featured songs that should have been much bigger hits than they were when they were first released or even a success at all. They will be songs from the past 3 decades but mainly songs from the past two years. The reason for it all is that even though there are plenty good solid pop hits in the charts at the moment, I still think the way a song is released in order to be a chart hit is still a complete mess. I think the policy of releasing a single on download and then weeks or even months later as a physical CD single has to be combined, that is both formats released on the same day, a Friday or Monday. This would allow a song to get it's proper chart placing earlier in it's release or else build on sales as more people download the song. I think it is only a matter of time before the physical format CD single is no longer being produced. I haven't bought a CD single in at least a year. A big part of the reason is that for an average of €5 you get the main song and just some average remix or album track tagged on. Where are the 4 or 5 club remixes that made all the Madonna / Kylie / most dance artists something that you had to buy on a Friday (here in Ireland) or Monday (in the UK)? What is also needed is someone to launch a proper download / pop magazine. Smash Hits! 2. I know I am always going on about the glory days of Smash Hits! but it was the perfect place to find out when all the new songs were out, sometimes a new song would have a gorgeous full page ad. The singles review section and song words throughout the magazine also immortalised every new song whether it was going to be a big hit or not. Much has been said about the possible return of Top Of The Pops but the two words that killed that are simple. Fearne Cotton. Well, not just Fearne, but an assortment of completely dreadful presenters in the years before the show was killed off. For me, the real pop show that was a huge asset to 90's pop was the ITV morning show, CD:UK. 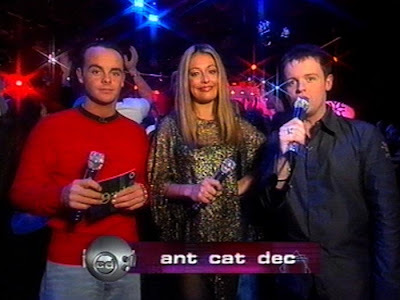 It is because of that show that Cat Deeley and of course Ant & Dec are still successful TV presenters. They were simply brilliant. They gave the impression that they were friendly with most of the pop acts they had on the show. When Simon Webbe walked over to Ant & Dec for a jungle task on "I'm a Celebrity..." the other night, all I could think of was Blue in studio some winter Saturday morning years ago. CD:UK was part of Saturday morning children's TV but by having the pop show as a separate show it was something students and twenty something's like me (at the time) adored as well. Simon Cowell has made a suggestion of buying the "Top Of The Pops" format and this caused great dismay to nearly everyone, well let him! When you look at the acts in the charts recently; Leona, the "Hero" song, Leon Jackson, Rhydian, Same Difference, all of these are Simon connected. As well as Take That, Girls Aloud, Britney and soon Beyonce, all appearing on this season's "X Factor". Going into a new decade, the year after next, there has to be a proper weekly UK new music show. That is what will save the music industry. The loss of proper pop magazines and TV shows I really believe has changed the way a song became a hit. Jennifer Lopez was a regular performer on both "Top of the Pops" and "CD:UK". In September 2007 her first single, "Do It Well" off her "Brave" album just went to number 11, (31 in the US). It is never good for a major artist to chart outside the top ten. Her second single "Hold it, Don't Drop It" would chart at 72. A disaster. But the truth is there were several singles by high profile artists not only having flop single releases but massive flops. Around that time big name record stores started to stock a smaller selection of CD singles. There were plans for Jennifer's album's title track "Brave" to be released on single but this never happened after the failure of the "Hold It, Don't Drop It". "Brave" was the type of pop that easily would have been a bigger hit just 2 or 3 years previously. But any song, good or bad needs airplay and exposure. The other song from the "Brave" album that should have been a single was "Mile In these Shoes". It was used as a promo for a the third series of "Desperate Housewives" but nothing much came of it. Jennifer Lopez has sung some of my favourite pop song of the past 10 years; "If you Had My Love", "Ain't It Funny", "Get Right" and most of all the full Intention remix of "Love Don't Cost A Thing". "Brave" and "Mile In These Shoes" should be songs to appear on a best of album but the words "greatest hits" would never be truthful. The thing with downloads is that most people don't know when a song is released as a download or may only purchase a song when browsing the I-Tunes site. It is possible for a song to chart if enough people buy the song from the album. If that is the case why isn't a song like "Better" by Boyzone, which is available on their current best of album, charting in the UK? That song is due for release, officially on December 15th. I'm sure I'm not the only person who has "updated" my UK I-Tunes page and then I'm suddenly forever connected to the I-Tunes American site where I can't purchase songs. I know that is probably reasonably easy to fix but I still haven't, mainly because I usually go into a download buying frenzy which can get expensive. I'm sure a lot of pop fans would read these words would agree with me and many sites have mentioned songs that they think should have been bigger hits, but I would love to read about more. It's also a way of highlighting songs to others who may not have heard them. Here's a well edited video, that was made by Camrebirth, for "Brave. And just the song, with v nice photo, for "Mile in These Shoes".